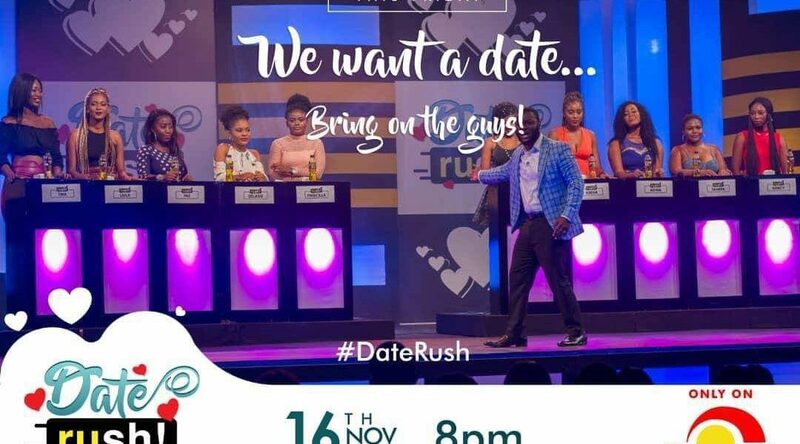 The trending and most talked about new dating reality tv show sponsored by Rush Energy drink and the Twellium Company Ltd has set viewers at home and social Media ablaze as the thrilling gets intense in episode 2 of Date Rush Reality Show on tv3 aired on 9th November 2018. As we getting warm up for the next episode of Rush Energy sponsored reality show let’s get to talk about what transpired in the previous show and also the expectations of Episode 3. The emergence of Social Media and dating sites have even made it more complicated and frustrating for single men and women to find the right person on a date or possibly be in a relationship with. This is why Ghana’s favourite Energy Drink, Rush Energy Drink in collaboration with Adesa production of Media General, Tv3 have introduced this Dating reality television show to help single men and women find a match to go on a date with which may later lead to a sustainable relationship. In Episode 2 last Friday the audience at the studio were treated to a fun filled atmosphere by the bachelors and the 10 beautiful ladies who were desirous of getting a date. Two single guys , Nana Kofi and Raymond stepped up to the challenge to wow and rouse the ladies for a date. Nana Kofi a muscular and charming by standard gentleman was the first to attempt. The ten ladies who seemed highly interested from the beginning was however left with 6 with their Rush Energy On, which means they will like to go on a date with him. However, he got lights turned off by 2 after his own friend narrated about his positive aides and negative sides to the audience and the ladies. Nana Kofi was then left with the grand finale of asking the remaining 2 ladies (Tina and Pazz) a question of which he will base his decision on. He asked the ladies what they will do with a sum of GHS 9000? Tough one huh,; Tina replied by saying she will invest the whole sum into a business and Pazz answered by saying she will invest 50% of the money into business and the remaining 50% in Nana Kofi his man. After hearing this Nana Kofi made a his decision by selecting the gorgeous Pazz as his date ; where they go on a date at the Date Rush Hide Out! Raymond Opoku a successful and ward winning marketer and public speaker was the next gentleman to mount the bachelors stage in his quest to arrive on a single out of 10 beautiful ladies on live television. He is good looking gentleman poised and affable with a great personality. His dancing and other talents on display had all lights on from the ladies. He has a dream of inspiring young entrepreneurs and changing people’s mindset about the rising Africa. The burden now had to shift to the ladies who must display their talent, skill, personality to now convince him to choose one of them for a date. It was quite complicated but worthy sight to behold with the ladies stretching out their hands and doing all in their power to catch the eyes of their potential date. One of the shocking moments was when a lady turned her Rush off because she thinks the gentleman is too short for her, but Raymond kept his composure. He was finally able to settle on 2 elegant ladies to which he posed the question “What will you do to ensure a long lasting relationship?” even though he was satisfied with both answers he chose to go on romantic date with Jessica which is fully sponsored by Rush energy drink. his date to the admiration of the audience in studio. This, however, was not without drama between the ladies, the bachelors and the amazing audience. Watch another thrilling episode of the Date Rush show on 16th of November 8pm exclusively on tv3, watch this and every Friday at 8pm on tv3 hosted by Nii Kpakpo Thompson and get thrilled.